Archaeological and historical records show that dentistry has been practiced in some form since ancient times. In the early Indus Valley civilization, small bow drills were used to drill teeth and cure tooth-related disorders. Remains of ancient Egyptian and Greco-Roman civilizations reveal early dental prosthetic and oral surgery techniques. Indeed, Greek scholars Hippocrates and Aristotle wrote about dentistry methods, including tooth extraction with forceps and the use of wires to stabilize loose teeth. 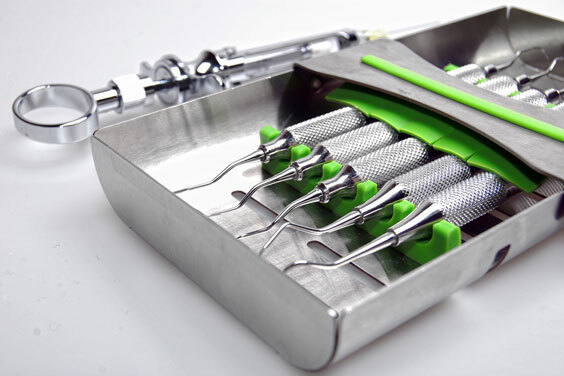 Today, dental instruments that are used in many dental procedures include mouth mirrors, probes, tweezers, and pliers, as well as related dental tools and accessories. One in two Americans puts off treatment they know they need to try to save money, but that raises risks of an emergency procedure which costs most people $6,000 and takes two years to pay. Daily Mail. Wednesday, 17 Apr 2019 20:46:46 GMT. CBS News. Wednesday, 17 Apr 2019 20:06:27 +0000. A mouth mirror is a small angled mirror designed to enable the dentist to see indirect areas, reflect light into the mouth, and retract the lips, mouth, and cheeks. Mouth mirrors can be disposable or non-disposable, come in many different sizes, and can also have magnifying properties. Probes, also called "explorers," come in many different types that are particular to specific applications. Sickle/contra-angled probes and Nabers probes detect pits and fissures, find cavities, and remove calculus, while periodontal probes are used to measure the depth of periodontal pockets. A Briault probe finds cavities on the mesial and distal surfaces of the teeth. Tweezers, also called "pliers" or "forceps," are used to place or retrieve small objects from the mouth, and come in locking and non-locking varieties. Tweezers that lock prevent the dentist from dropping material in the mouth. Tweezers come in many sizes, with tips that are plain, serrated, pointed, or rounded. Basic dental instruments are attached to handles, which enable the dentist to grasp the tool. Handles come in many different materials, sizes, styles, textures, and weights, depending upon their intended use and the preference of the person using them. For example, someone who wants to maximize control may choose a model in a larger diameter, while someone looking to minimize fatigue would choose a lighter model. The American Dental Association website provides extensive information about virtually all aspects of the dental profession. Its Dental Product Guide is a directory of supplies, equipment, and services that are relevant to dentists and other dental professionals.